Here are my tools in my hotel’s room desk. 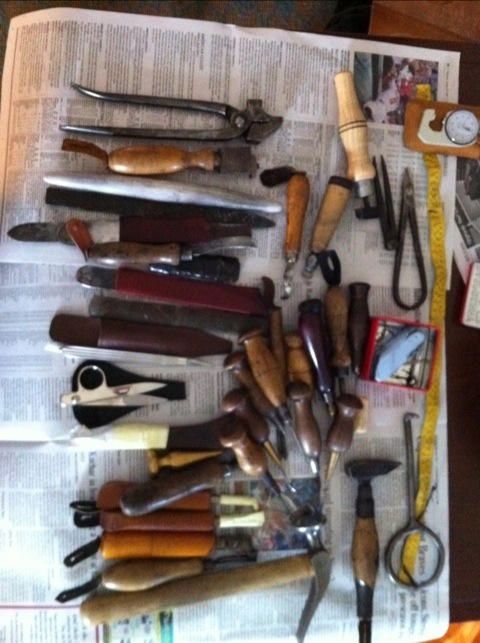 This is the collection I brought here to the States to start my shoemaking life and teacher carrier. Useful to see what you consider your can’t do without tools, having seen all the tools you have collected. I know I tend to collect tools, but only really use a small number of them most of the time. But sometimes I just need a variant of the usual to achieve the job easily. Then the collection comes in handy. Is that an electric burnishing Iron? I saw one on a Japanese video and he was using it to adjust the uppers just prior to pulling the last. Does it have a specific tool name? wonderful, have been looking for a way to correspond with with cure pros like u. in the pattern making i did not get the exact mesurements you took with the ruler.